If you like having insane DPS and sneaking around you will love being a Swashbuckler. Also, if you're a Swashy be prepared to use their fast and addicting hot-bars. This class is entertaining and very fast paced. The dapper and quick witted scouts are always prepared for battle and can sneak past enemy without a whisper of their existence. Overall the Swashbuckler is an addicting class and once you play as one i feel you might find yourself wanting more and more of the sneaky scouts. From the Everquest 2 player manual: Those who seek to engage in combat with grace and panache while crippling opponents with strategic attacks will find the Swashbuckler profession to their liking. 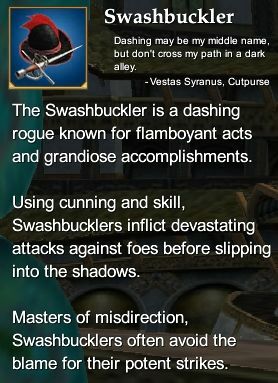 The Swashbuckler is a rogue who prefers to perform flamboyant acts of skill and daring, striking suddenly and using shadows to confuse opponents. The Swashbuckler best serves a party as a secondary line of physical offense, inflicting damage on opponents - particularly in devastating first strikes. Swashbuckler Epic Weapon Series (80) - Rise of Kunark Swashbuckler epic weapon. This page last modified 2013-01-24 17:51:32.